There are million of scooters teeming through the streets of Vietnam’s largest City, Saigon, and they are an attraction in their own right. Totally mesmerizing to watch, they buzz about their business, inches apart; streaming down avenues, weaving, wending, intertwining their way across town and performing hair’s breadth manoeuvres at every cross-road. 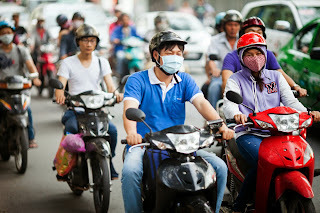 Young women wearing peaked helmets sit straight-backed at the traffic lights. Families ride pillion – four up plus baby. The blasting of horns and the screech of brakes is constant, the air is fume-filled and the traffic relentless. But it’s fascinating. See more photos from Vietnam.